network is being operated by more than one player viz. GAIL (India) Limited (GAIL), Gujarat State Petronet Limited (GSPL) and Gujarat Gas Company Limited (GGCL). GAIL primarily serves consumers who have been allocated natural gas by Gujarat currently has the most developed pipeline network in the country and is the only state in the country where the gas pipeline network is being operated by more than one player viz. GAIL (India) Limited (GAIL), Gujarat State Petronet Limited (GSPL) and Gujarat Gas Company Limited (GGCL). North Gujarat Network – The network obtains gas from ONGC gas fields in the North Gujarat region and serves customers in and around Ahmedabad. 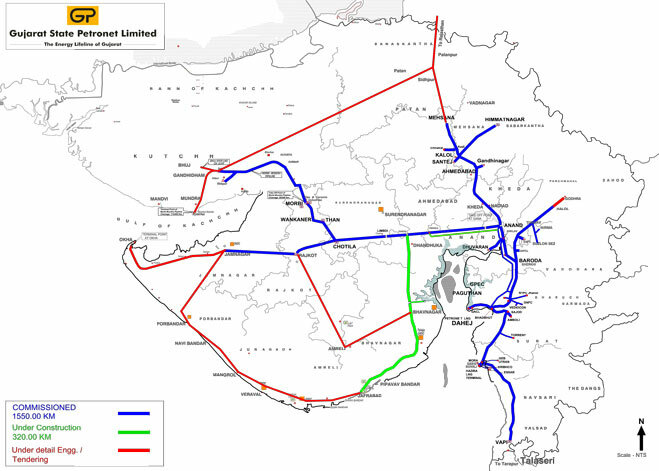 The network is much smaller than the South Gujarat network and has a combined pipeline length of 175 Kms. The network supplies gas to around 30 consumers with a combined allocation of 2.2 MMSCMD. Ex-Hazira – GAIL provides gas to some consumers in Hazira, directly from ONGC’s GPC at Hazira, the landfall point for ONGC gas from the western offshore fields, through dedicated spur lines. All these consumers are within 5 km distance from the Hazira GPC and have a combined allocation of around 11 MMSCMD. GAIL has several customers connected on HVJ Pipeline, DVPL Pipeline and DUPL Pipeline. GGCL is a gas transmission and distribution company operating in the industrial hub of South Gujarat. It distributes gas to domestic, commercial and industrial consumers in Ankleshwar, Surat and Bharuch. GGCL has a total pipeline length of about 2,700 km and services 2.30 lakh customers. GGCL is obtaining gas from GAIL, GSPC as well as Cairn Energy. GGCL also operates two trunk pipelines viz. Hazira-Surat and Hazira-Ankleshwar. The former is a 15 km pipeline carrying natural gas from gas fields in the Cambay basin to the distribution network in Surat. The latter is a 73 km trunk pipeline running from Hazira to Ankleshwar. GGCL has also extended the network to Jhagadia. The potential for growth derives from the ever-increasing energy demand-supply gap in this economically vibrant area. GSPC Gas is a distribution arm of GSPC with more than 64 CNG Stations and 0.92 Lacs domestic and industrial customers across Gujarat. GSPC Gas envisages to connect 2 Lacs customers very soon and it currently sells approximately 2.3 MMSCMD gas to several customers located in 14 Districts of Gujarat. Adani Energy Limited, Ahmedabad, Sabarmati Gas Limited Gandhinagar, HPCL, Ahmedabad, GAIL (VMC), Vadodara, and Charotar Gas Sahakari Mandali Limited are other distribution companies.